This week as part of our Getting to Know You series, we introduce you to our new Director of Social Work, Christin Martinez. 1. Tell us a bit about your background and where you received your education. I was born in the Dominican Republic and moved to the United States when I was 10 years old. I grew up in the Bronx with my parents and siblings. I went to Mercy College and graduated with a BA in psychology. 3. Why did you choose to work in the rehabilitation and nursing home field? I have six years of experience working in nursing home/rehab facilities. I greatly enjoy my work! I’m excited and blessed to continue to work with this beautiful population. 4. What do you like about best about working in the healthcare field? I was raised by my 95 year old grandmother old and I wanted to be an advocate for the elderly. I feel accomplished when I arrange services for my residents or when I educated them about services in the community. 5.Tell us one Fun Fact about you. I feel proud to be able to assist both English speaking populations as well as Spanish speaking. Adira at Riverside takes great pride in providing our residents with effective and appropriate infection control and infection prevention! Our staff has been educated on disease transmission and appropriate interventions to prevent the spread of infectious organisms. In tandem with that education; our expectation of all families and visitors is that you respect protocols that have been implemented for our Residents including those Residents on Isolation Precautions! As per CDC Guidelines, hand washing is the #1 defense against the spread of all infections! Please wash your hands upon entering and leaving the Facility to be part of our Infection Prevention Campaign! 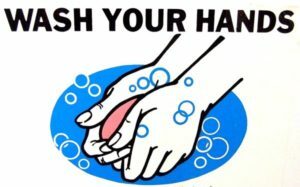 Remember: Infection Control is in your Hands! This month as part of our Getting-to-Know-You series, we introduce you to Tiffany Jenkins, our new Director of Client Services. 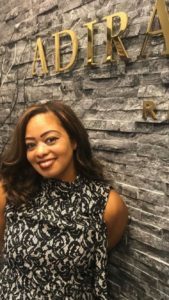 One of our primary goals at Adira is to provide personalized, top-shelf service for our patients and their families and we are so excited that Tiffany has taken on this exciting new “concierge” based role. Tell us a bit about your background and experience. I am a multifaceted individual with an ambitious attitude who has over 15 years of diverse healthcare experience in leadership positions. Each position; from direct patient contact to medical billing and collections, to insurance verification and claims processing to coordinating and executing single payer agreements to obtaining authorizations for in office and ambulatory surgery procedures to marketing initiatives or maintaining client contracts and relations has providede with the knowledge and skill to expand my career. It’s essential to continuously reinvent both yourself and your organization to evolve and transform with the every changing healthcare landscape. You recently made the switch from marketing for Adira into Client Services, what are you enjoying most about your new role? The variability of my job gets me up in the morning. The diversity of the work that I do ensures no day is like any other. My focus is always on bettering the community. I work in an environment where I have the ability to use my authentic characteristics of being intuitive, empathetic, compassionate, and supportive to positively impact our patients, residents and team. What do you like about best about working in the healthcare field? I am passionate about helping others. Working in healthcare affords me the opportunity to do so. Even though I’m not directly treating patients, I’m still in a position to make decisions that will positively impact their experience. This industry is filled with challenges. By solving each individual problem in whatever way your job allows, you experience sense of accomplishment and gratification. Teamwork is also a big part of the job. You experience great job satisfaction knowing the team shares the same vision and dedication to the mission and is working towards a meaningful joint goal. Tell us one Fun Fact about you. I am a Pisces. I love being in or surrounded by water, preferably tropical water. Like water, I am fluid and adaptable. So, if you’re in the building be sure to keep an eye out for Tiffany and her mega-watt smile!